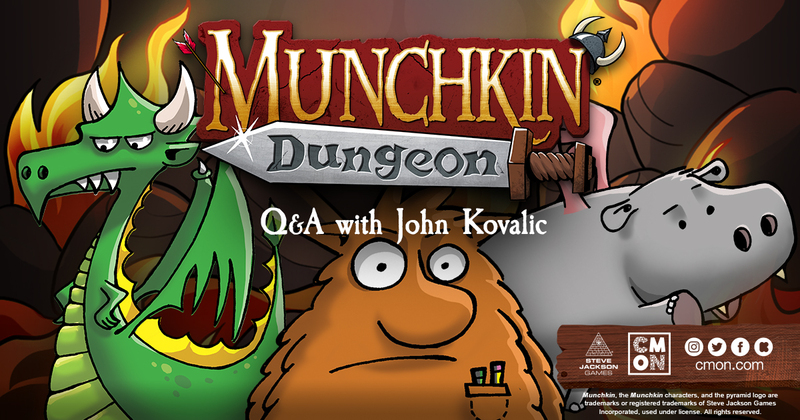 The world of Munchkin simply wouldn’t be the same without the amazing artwork of John Kovalic. He has drawn thousands of cards for the game over the years, and is now lending his artistic skills to Munchkin Dungeon. He was kind enough to sit down with us to answer a few questions about this latest game being added to the family. CMON: What is it like seeing miniatures of your artwork? Is there a particular piece that you’ve been wanting to see that is now available in 3D? How involved were you with the creation of the miniatures? John Kovalic: I've seen minis made from my drawings before - some bad, some good... but nothing as spectacular as these! I don't know if I've been waiting to see only one: there are JUST SO MANY. And they all look fabulous. CMON was wonderful about insisting I work closely with the sculptors. I updated a lot of the drawings, but really, after that, the sculptors just took the ideas and ran with them. I'm gobsmacked at how the finished minis look. I almost literally couldn't be happier with them. CMON: What particular character from Munchkin Dungeon do you like the most? Which do you feel was the most fun to draw? Which do you think most epitomes your style of artwork? JK: I love how the Web Troll (sometimes known as "Big Fuzzy") turned out. He's so central to the game - almost as well-known as Spyke and Flower, the Super Munchkins. So, to see CMON's sculptors do such a great job on such an iconic character nearly had me squealing with joy. The Plutonium Dragon is another fave. But I draw more Trolls than dragons, so I probably like that one the most. Amazingly, all the figures in Munchkin Dungeon look like "my style" - something I previously would have thought to be impossible. CMON: Most of your artwork is done as cards for games or in comic strips. What do you think about seeing the animated pieces as part of the Kickstarter? What’s it like seeing your artwork come alive like that on the screen? JK: The animations took me completely by surprise. They are absolutely delightful. I particularly loved the flying Hippogriff. Whoever animated her deserves a pay raise. Or many beers, at the very least. Our thanks to Mr. Kovalic for taking the time out of his busy schedule to talk with us. You can catch all of his great artwork over on the Munchkin Dungeon Kickstarter now!